Snack foods provide a unique opportunity for us to show our technical advantage. 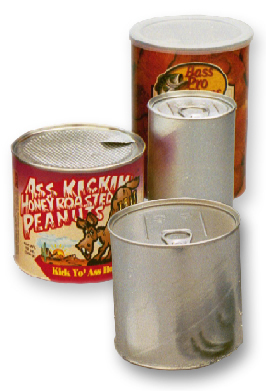 Poly-foil inside is heat sealed and metal tops are applied with a “double hook” seam to insure we provide a can that can lock out oxygen and moisture. Use our compounded metal bottoms to prolong shelf life and insure that your customers always have a fresh product. We can also provide a foil membrane top that reduces waste and protects the consumer against rough edges. The overcap maintains freshness after opening. Add your label or label after filing and you have just the can you need to keep your product in from of your customers.